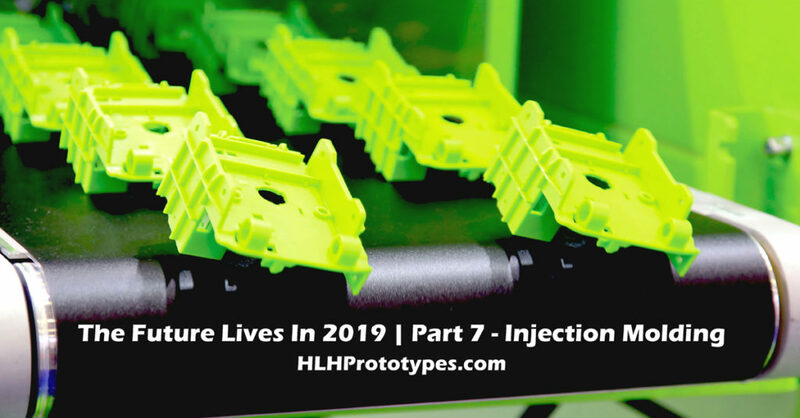 For part 7 we take how the future of injection molding is living today in 2019. But what is changing quickly in the injection molding world is how rapid injection molding is now being used in product development as a path towards positive revenue and not just as a bridge to high-volume tooling or as a part verification testing option. Here at HLH we talk low-volume injection molding and rapid tooling all the time for the industrial sectors we serve, automotive is sector that utilises rapid injection molding on a regular basis, as an example. But what we are starting to see is a spike in how rapid injection molding (low-volume injection molding) is being accepted and used successfully for startup consumer product fulfillment. Here is how product development for end-use consumer products made via injection molding used to work. Well, it still does in many cases but it used to be the only option. Find a massive sum of money to invest in your high-volume injection molding tool(s) and fully commit to your project, often risking everything you have ever earned if you were a startup. The only way you could make your investment back is by landing one or several big chain retailers whose market strength can help you pay off your initial investment via massive volume sales. The reality of this historical product development model were quite a few injection molding tools never generated enough sales volume to recoup the initial tooling investment. This model was driven in large part because bricks and mortar retail held all the power and pushed profit margins so low for product developers that the only path forward were manufacturing processes like high-volume injection molding that offered the absolute cheapest per unit cost. The evolution of injection molding was a technique to help launch product faster, known as bridge tooling (also known as rapid tooling, ProtoTool here at HLH, as well as other names). This rapid manufacturing technique (in a nutshell) is to build an injection molding tool that is significantly cheaper than a full production tool in a fraction of the time it takes to create a full production too. The trade-off being a considerably shorter tool cycle life (10,000 to 100,000 parts typically) and normally slightly higher per unit costs because production runs are shorter. This was primarily used as a stop gap measure to get to market faster while your full production tool was being built. It has been around for a long time but was not utilised for launching product in a profitable way until recently due to market forces. With all the online retail channels and the explosion of retail selling via social media it has never been easier for a startup or entrepreneur to sell product…of any description. The online world has given power to the product developers, power that they never knew prior. With this change in retail selling comes the next evolution of injection molding, in the way that the product developers look at low-volume rapid tooling can be used as a sustainable path to positive revenue. Why? Because through online channels you get the benefit of the majority of the profit, not Kmart. If you sell something for $20 online that costs you $4 to make via a low-volume injection mold tool then you are making $16 gross per unit and let’s say $12 net per unit after additional expenses (some channels you will make more and some you will make less). If you are selling something for $20 at Kmart that cost you $3 to make via a high-volume full production injection molding tool then you are probably making $4-5 net profit and Kmart makes the rest. That is a massive per unit profit bump for the modern day product developers. Do you still need to move some decent volume? Sure, but you also don’t have to completely risk everything you have to bring your dream to reality. The new model of niche selling and low-volume production runs via injection moldingg is a completely viable model to profit via online retail channels and door to door fulfillment. Utilizing low-volume injection mold tools also helps to preserve valuable capital dollars that can be used for continued 2.0 product development, marketing, and other vital aspects of making any product a success in the new retail world. Remember that 100,000 parts can still be gained from rapid tooling. 100,000 times 3 to 5 times profit margin or more is a serious gain. So let’s get back to the theme of the series, the future living in 2019. My argument is that injection molding as a traditional high-volume manufacturing option can now be sustainably used as a rapid low-volume manufacturing option for a lot of consumer product development projects because the retail market has changed. Not only is it possible to use low-volume injection molding this way but, it is, in fact, being used now, in 2019 to deliver profitable market solutions to the product development world in a way that simply did not exist in the past. The future want of using traditional manufacturing methods to deliver low run profitable products lives today. My personal preference is still shipping 20 containers to Wal-Mart on an LC but there are other paths forward when retail buyers are in your way. Utilising a low-volume injection molding solution first can now yield decent profit for many projects without eating all your capital. A trend to explore in 2019.